At GXI Group unikglass has been designed to replace any kind of conventional hinged door with a sliding glass panel to divide rooms in residential, commercial or hotel projects. It is compact system for a modern and minimalist design glass partition walls. Clear opening free of floor tracks. For 8, 10 or 12 mm glass and up to 100kg. This product is available with a self closing system. Ideal for partitioning kitchens, lounges, bathrooms, bedrooms, offices, etc. Compact system for a minimalist design. Cleared passageway with no floor profiles. Clip-fixed gallery for a quick installation. Door secured by pressure clamps; no need for mechanized glass (tempered or laminated glass). Holds 8, 10 or 12 mm glass up to 90 Kg. Ball bearing system for smooth opening. 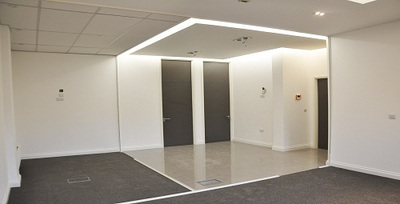 GXI Group have 8 years experience and providing complete office and glass partitions services on a large scale for a range of businesses, offices and warehouses throughout London, Complete and provides a high quality service. Car boot sale ad details Unikglass by Klein Europe for sale in London. Unikglass by Klein Europe available on car boot sale in London. More Other furniture for sale in London and more second hand sale ads for free on 2lazy2boot - London car boot fairs - 33304.